It’s been a bit quiet here on the blog…do you hear the crickets?!? We’ve been busy working on a project at our house, and it is taking more time than we anticipated. Aren’t all house projects like that, though? We’ve learned over the years of owning an older home that it usually takes twice as long to complete a home project. 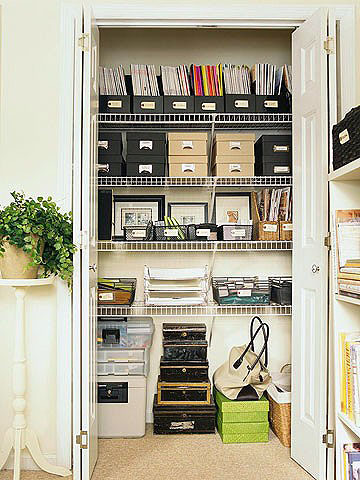 First, you must “undo” what was done before you lived in the house before you can “redo” any of it. Sometimes that involves some surprises along the way…like multiple layers of wallpaper, which we discovered during this particular project! 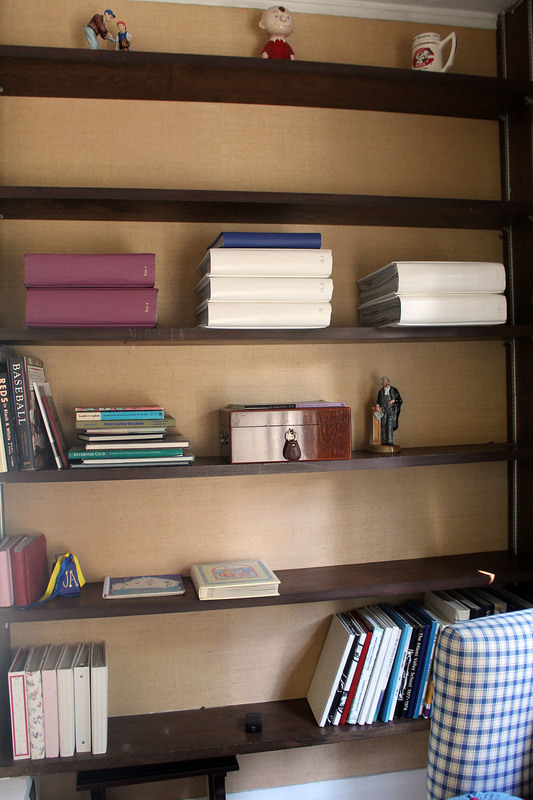 This room is on the second floor of our house, and it’s intended purpose has been a home office. The previous owners had shelving installed on both sides of the window. While shelves are usually a good thing, we did not care for these for two reasons. First, our house has white painted trim in every room; these shelves were a dark stained thick wood, which did not match the style of the rest of the house. 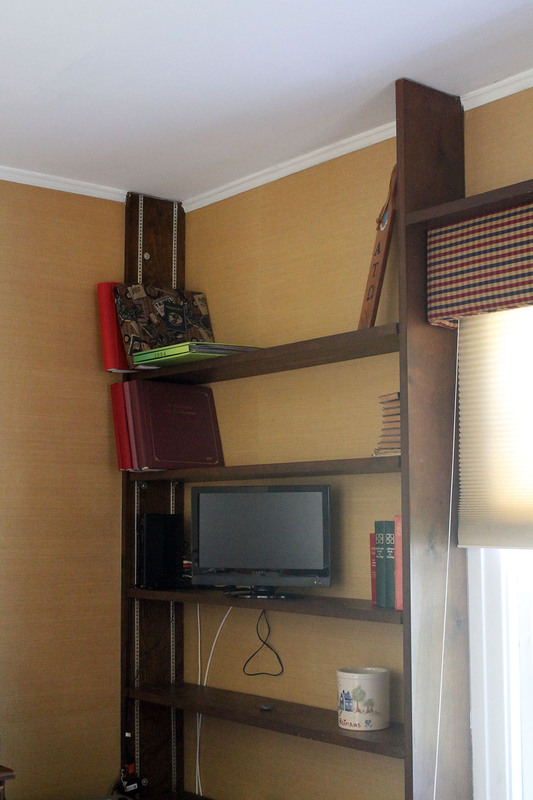 And the shelves were not really deep enough to function for much more than decorative items…even most books hung off the edge of the shelves. These pictures were taken as we started to remove the contents of the room (kind of messy, right) so that we could tear out the shelving. 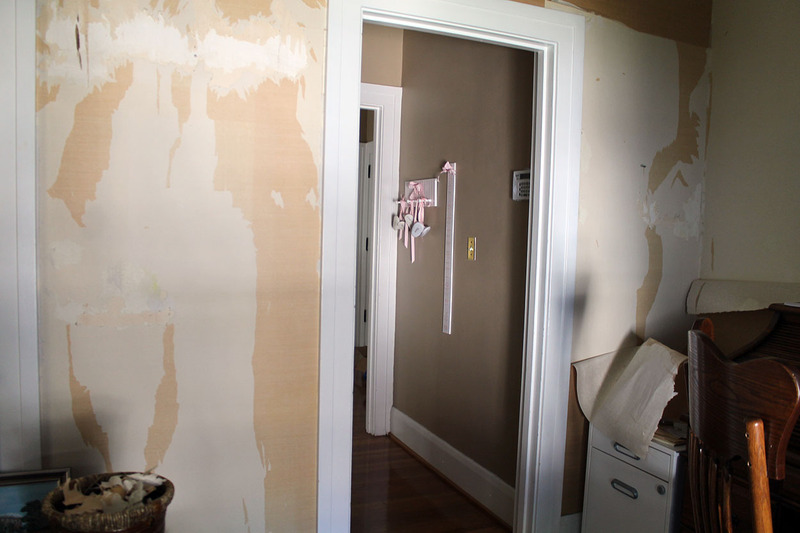 Once that was done, we started stripping the wallpaper. 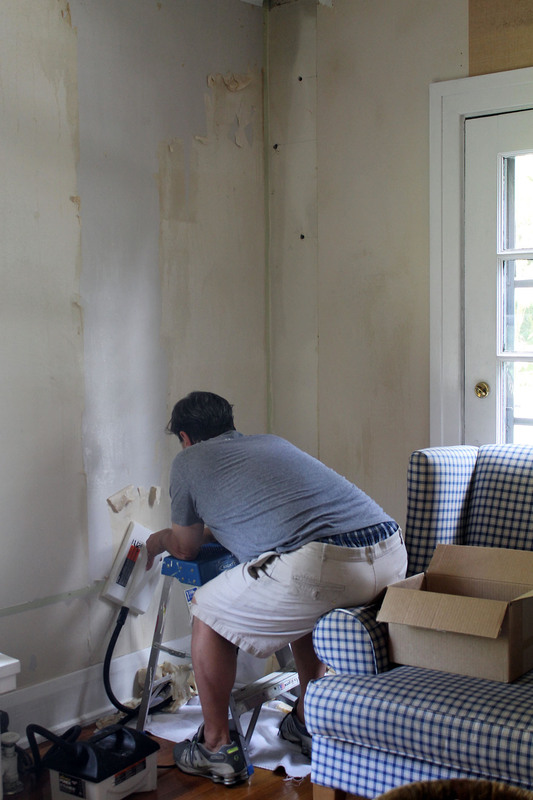 That was when we discovered three additional layers of wallpaper underneath the top layer…ughh! That’s right…FOUR layers of wallpaper! That’s my very hard-working (and somewhat frustrated) husband in the above picture with the wallpaper steamer. After that final layer of wallpaper was removed, it was determined that the walls needed some repair work. So needless to say, we are a little behind schedule on finishing the room. 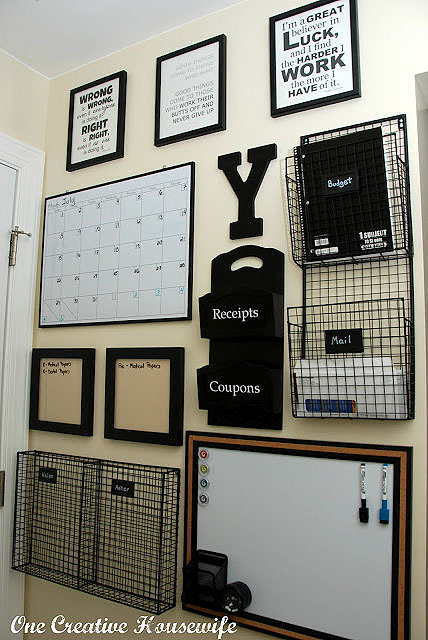 You gotta’ love Pinterest! It is a great place to find inspiration…sometimes I find TOO much inspiration there! 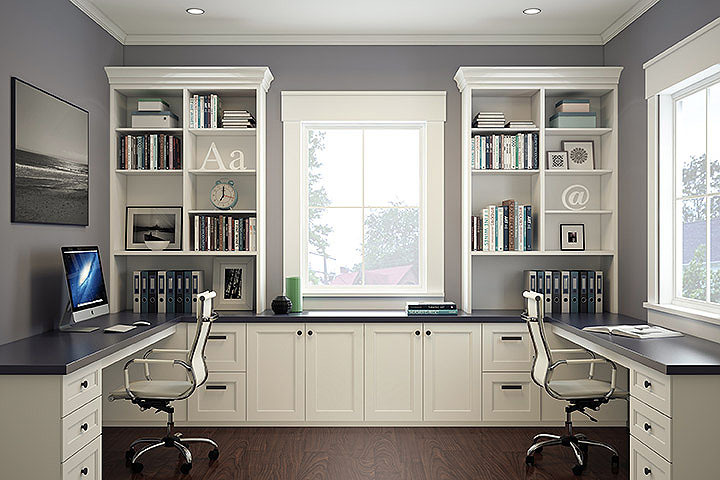 Some of the elements in the room redo will include…multiple desk spaces, decorative storage boxes, a cushioned window seat, a neutral gray/ black/ white color scheme, as well as organizational areas and walls. 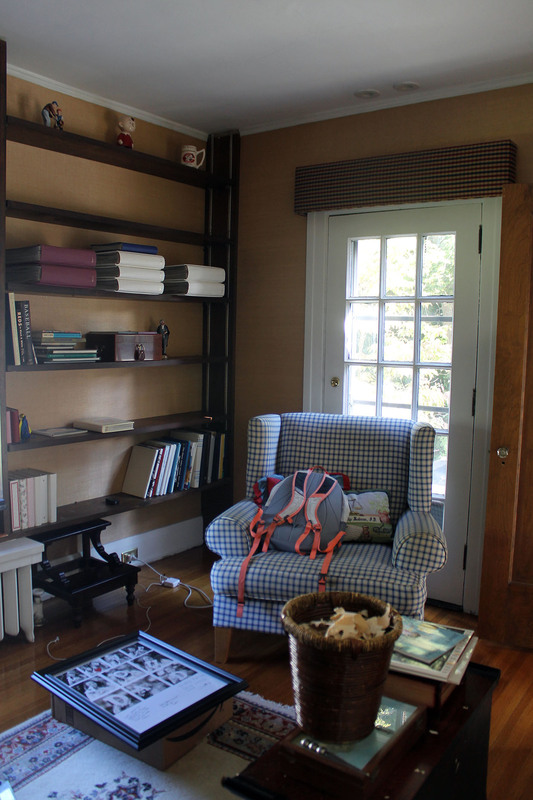 Of course, our redo will not be so “Pinterest-perfect,” but it will allow the room to function better as a home office. So stay tuned…I will be sharing the completed room redo soon, hopefully! Me, too…it’s coming together, slowly! Can’t wait to see the window seat with the cushion! Thanks for your help with that! !